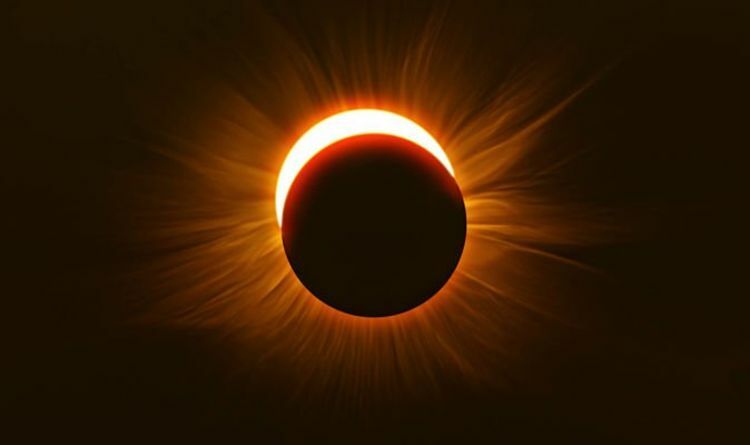 Solar eclipses occur around two weeks before or after a lunar eclipse. There are usually two eclipses in a row. But other times there are three during the same eclipse season. The eclipse visible from the UK in the very early hours of the morning. The Moon will enter the Earth’s shadow just after 2.30am GMT. The full eclipse will then occur just before 5.15am. The entire eclipse lasts for more than five hours and will end at 7.48am. Why do eclipses take place? An eclipse of the Moon takes place when the Earth lines up directly between the Sun and the Moon and the Moon lies in the shadow of the Earth. The shadow can darken the moon for up to five hours due to the since the Earth is about four times wider than the moon. The last total lunar eclipse was on July 27, 2018. Lunar eclipses are also known as blood moons due to their deep coppery red hue. The moon changes colour as it is lit up by light which has passed through the Earth's atmosphere. Then the light is bent back towards the Moon by refraction. Dust in the Earth’s atmosphere blocks out the blue light waves usually seen, which are higher in frequency. This gives the longer wavelength of red light the chance to shine through instead. People in the UK will be able to see every part of the eclipse if they stay up all night.